There are many mobile users who appreciate the possibility of easy online recharge. It is one of the fastest growing trends that have changed the market a bit. This way the individuals do not have to go to the shop to get the recharge done which is a huge relief for many of them. Digitization has changed ways we do a lot of things and the mobile industry is impacted hugely by it as well. There are many of these websites that offer many services along with easy recharge options which is why they are so popular with the users. These include DTH, electricity bill, broadband payment, landline bill, bus tickets, gas bill etc. This is a great way to save time which was otherwise invested in travel and wait at the shops.. It is convenient as everything can be done with just a simple click of the button with the use of active credit and debit card. There are many such websites which offer the same services and here is a list of the top rated of them all. 1) PayTm: This is the top rated website for mobile recharge in the country. It was founded in the year 2010 and has its office in Noida. There are currently about 20 million user on the website and it has become popular due to the number of services it offers along with discounts. The Paytm coupons are the reasons why users are always attracted to the website and keep coming back. The services offered are bill payments, mobile recharge, tickets booking etc. 2) FreeCharge: This one is a website founded around the time when online recharge market was gearing up in the year 2010. It has its headquarter in Mumbai. The website picked up popularity with the attractive opportunity of cashback of the same amount which was spent on it. The coffee and fast food joint Barista and McDonalds were the first retailers to associate with them which helped them pick up. It offers many services like online recharge, bill payment, data card payment etc. 3) MobiKwik: This one is a wallet service which allows users to even save some money in it which can be used later. This can be used to recharge or pay mobile bills. This wallet was founded in 2009 and has been joined on by snapdeal, shop clues and many more online shopping websites which makes it an easy choice for many. It offers easy payment options which make the website even more convenient for use. 4) rechargeItNow: This is a website which caught on the bandwagon as soon as the market picked up. It started in 2012 and post its commencement it has offering good service to its customers. They provide easy recharge options for almost all leading operators which includes BSNL, reliance, Idea, Airtel etc. 5) JustrechargeIt: This is another highly popular website that has enjoyed the long love of customers. It is a leading brand of mobile recharge and thus the website has over 4 million registered users. It has its headquarters in Mumbai and offers services like Mobile recharge, DTH recharge, Data Card recharge and bill payments. Users can even buy bus tickets using their credit and debit cards along with the use of direct bank credits. 6) EzRecharge: This is dedicated to mobile recharge option for all kind of users. It comes with a very simple website design which makes it easy to make a quick recharge and move ahead. There are also clear information on the deigns and the tariff which are available for all users of the website and that is the reason why it has become so popular amongst users. There are many services which are offered on this which include DTH/TV recharge, data recharge, and monthly bills. 7) My Recharge: This is a highly popular website amongst the customers and also ranks higher in the number of use. It provides easy recharge options and also has several services which include SMS recharge, website recharge and also app to get the recharge done. Ne can also recharge data cards, DTH and mobile all at the website. 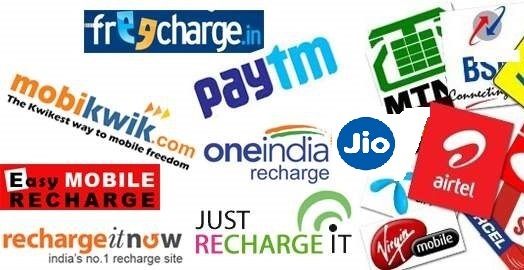 8) Fast Recharge: Something which started way earlier than many other in the year 2007 this website has a lot of users which recharge their mobile using it. It is used for prepaid recharges, data card recharge, DTH recharge, Postpaid recharge. Along with easy payment options it also has many recharge choices which includes EMI options, prepaid instruments use of debit and credit card etc. It is highly secure and that is the reason why many users do not think twice while using their cards on the website. 9) Easy Mobile Recharge: This one is picked by many users for ease and comfort of mobile recharge. What makes it stand apart is that it also imparts information on what are the latest offers which are available on for different operators. This makes it easy for the customers to save money or choose the best. It has added information on smart phone, gadgets etc. which keeps the users engaged. 10) Reload.in: When the customers want something quick then this is the easy way to recharge the mobile phones. This website provides recharge options for all leading operators and also accepts all payment options like credit card, debit card and internet banking options. One can use the website to buy bus tickets, pay utility bills, mobile recharge etc. The whole recharge deal is something that one cannot live without. The customers often look for something which saves them time and money and that is the reason why these online recharge website are getting so popular. It is always best to choose a website which is secure as there will be a lot of information that will be shared over it. Think about it before you choose to make the payment. The above list is trusted by many customers because of the security they provide along with the services offered. One can choose any of these sites which suits them best but should make that decision after good thought.